Religion professor Brad Holt will give a presentation on “St. 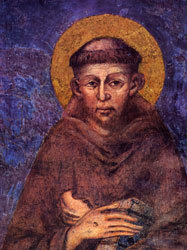 Francis of Assisi in the Thirteenth Century: A Life in Art and Text” Nov. 10, 3:30 p.m. in the Marshall Room. St. Francis is one of the best-known saints in Christian history, but he is often reduced to a garden ornament. This presentation will give a fuller picture of the life and vocational struggles of the Patron Saint of Ecology and founder of the Franciscan Orders. Dr. Holt participated in a National Endowment of the Humanities Seminar in the summer of 2006, devoted to an interdisciplinary study of Francis. The group of 15 professors stayed in Rome for one week, Siena three weeks, and Assisi for two, each pursuing different projects with regard to Francis, and discussing the earliest texts and paintings. The presentation is sponsored by CTL. Refreshments will be served.